We at Il Caminetto have always loved quality and true flavors. For this reason we choose only the best ingredients and we work with them with knowing skill so that we can offer you exquisite plates drawing inspiration from the Tuscan cooking tradition but not shying away from the right reinventions. 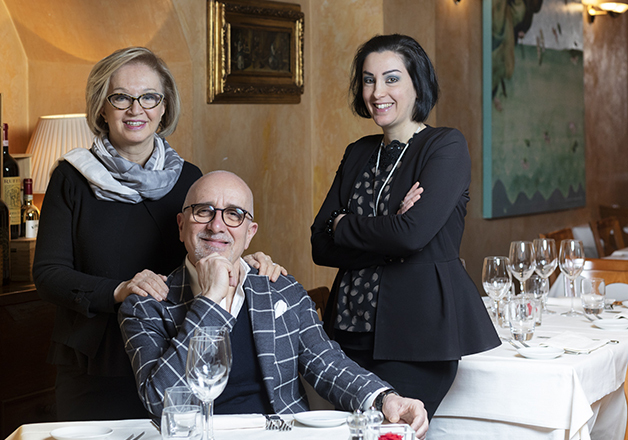 Every day we take care of our customers, spoiling them with small culinary works of art, and we do this with enthusiasm because we have the fortune of operating in a magical, unique, and special setting: a Restaurant in Florence near the Duomo. Located in the middle of the historic center in a characteristic street overlooking the Piazza del Duomo, Il Caminetto offers a warm and inviting atmosphere combined with attentive but never invasive service. A wide selection of wine adds great value to the restaurant, privileging of course the best Tuscan labels, lending the best of support to the creativity of our chefs. Serving delicious dishes made the freshest raw ingredients around is the desire that animates our kitchen day-in day-out. Our chefs are in constant fermentation: their objective is to make dishes with a unique taste and a perfect equilibrium. For this reason they pass their time cooking, tasting, and savoring their creations, and only when they feel that theyâ€™ve reached their best potential do they add new proposals into the menu. Our succulent and intriguing dishes, in which quality, tradition, and innovation are combined, our made with top-quality prime ingredients coming principally from our enchanting region: Tuscany. We only serve fresh ingredients, taken care of by the knowing hands of our chefs, making use of an "express kitchen" but still capable of non-excessive times: the "right times" is what they focus on, the quantity strictly necessary to be able to taste the quality of a dish prepared on the spot.